A WARNING TO ALL THE PEOPLE THAT HAVEN'T READ THIS BOOK YET: THIS REVIEW IS A LIVING SPOILER!!! First of all, I start with saying that this isn't my usual genre. 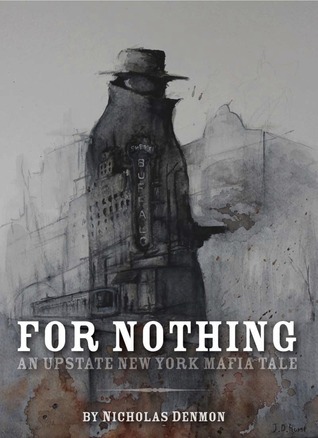 It was my first attempt to read a mafia book. Usually I try to avoid even mafia movies, though some I have seen (some bad, some good), like Donnie Brasco, it was a very good one (and Johnny Depp also got me so bad! Can you blame me for watching it?). But this book was A M A Z I N G !!! It really got me hooked and I was glued to the pages (virtual, since I was reading an epub). My favorite character was Alex (obvious! ): he also reminded me a little of Donnie Brasco/Johnny Depp. An undercover cop, pretending of being a mafioso. And I found him sweet, determined, loyal, a good friend, good at heart... I loved him! I couldn't help but feel desperate with him when he found Jack's lifeless body... and feel so so sad for him when his wife Charlotte rejected him... and everytime he dreamed or remembered about past moments with her and their little girl Ella... it almost made me cry... (ok, I admit, once I have cried!). And then also when he thought of the times spent with Jack... I felt so sad :( And loved every desperate moment! Masochistic me, yeah, I know! I also found myself loving some of the bad guys! I really didn't think I would have! I'm a good girl! But Sal and Jimmy weren't that bad after all... right? Oh well, doesn't matter. It pained me, though, when Sal died. And what a death! Poor guy! Almost burned to death! It was heartbreaking when he begged Alex to shoot him. And I felt for Alex too. It showed he cared for Sal after all. Because he really wasn't that bad of a guy. It even pained me when Sal found out his son had died. Another scene, among many, I liked was the fight that came out when the assassin, Rafael, got to Wizeguyz. God that was a hell of a bloody fight! Loved every second! Yes, I am a weird girl. So what? The end... The end was WOW! I already knew it wasn't really the end and there's a 2nd book coming out soon. I knew it was unlikely that they caught the real assassin. But the way the assassin made clear his presence... made it clear he was still around... watching Alex and his family and his friends... I haven't seen that coming. It was unexpected. And creepy. And surprising. And amazing! I can't wait to read the second book! Nicholas Denmon is really an amazing writer! He always surprises me. Nothing was expected. I enjoyed this book veeeery much! And I recommend it to everyone!